Eight days into the new year, and I was struggling with a topic for the first post of 2015. Then I woke up to read the report in the Chicago Tribune about the terrorist attack at a Paris magazine office that left 12 people dead — magazine staff and two police officers. The current web site masthead of the French magazine, Charlie Hebdo. The front-page report described a “military-style, methodical killing” at the offices of Charlie Hebdo, a periodical that satirized politics, culture and religion. It was the latter — commentary and cartoons on the Muslim faith — that apparently drove three men to madness. The Tribune featured two photos that summed up the “before” and “after” of this tragedy: A gathering of Parisians mourning the brutal attack, and a still photo of footage of the alleged murderers, brandishing rifles as they fled in a black sedan. As I leafed through the Tribune Section 1, the main news content, I found another story — a report of an even more gruesome and deadly act. On page 11, I read a report of how a vehicle loaded with bombs was detonated near a police academy in the city of Sanaa, Yemen. others and leaving a trial of mangled bodies and twisted wreckage.” The accompanying image shows an obviously distraught man near the scene, his hand to his head, flanked by two nearby authorities. Both mass murders reportedly were the result of Muslim extremists. Both took place in capital cities. One took place in one of the great capitals of the Western world. 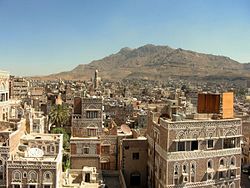 One took place in an ancient city on the Arabian peninsula. The question I have is why does the murder of a dozen people in Paris “rank,” at least in terms of news coverage, above the murder and maiming of 35 people in Sanaa?